At the beginning of the month, our very own Will Smart, who is a Partner at our Northampton branch, was invited to join an esteemed panel at the first ever landlord and investor event put on by Newman Property Experts. Will, who is passionate about counteracting the current Government’s attacks on small owner managed businesses, discussed changes to residential property taxes with the landlords and investors in attendance in a bid to ensure the industry stays lucrative for those who have devoted much to it over the years. Due to great feedback and demand for more, our in-house tax experts have now prepared an overview document on the subject to ensure everyone can keep on top of residential property tax changes. Not only that, we also have an article on changes to tax rates for enveloped dwellings held by companies. Of course, if you would like further assistance you can contact one of our local offices today and someone will be happy to take your enquiry. Continuing with the event’s theme we are also pleased to announce that our Rugby branch were official sponsors the Summer Social, a fantastic community event put on by the local pub, The Merchant’s Inn. Also involved were AHR Consultants and Handelsbanken UK. Well done to all for putting on such a brilliant event which gave all locals the chance to meet and mingle. In addition, Cottons Daventry have literally been gearing up for their big summer event which is also community spirited but carries a different theme as the big hearts at that office will be getting on their bikes in a bid to raise money and awareness for MacMillan Cancer Support. Cottons are proud to sponsor the Daventry Cycle Sportive as well as offer up some of our best team members to take part in the goings. The Daventry branch’s own Lisa Malone, Richard Wilch and Callum Veasy will be hitting the saddle on Sunday the 1st July so look out for more on that or check out the website if you would like to get involved. June was a big month for newbies and existing members alike. All of our branches welcomed new starts and seen their long standing staff progress in their roles. 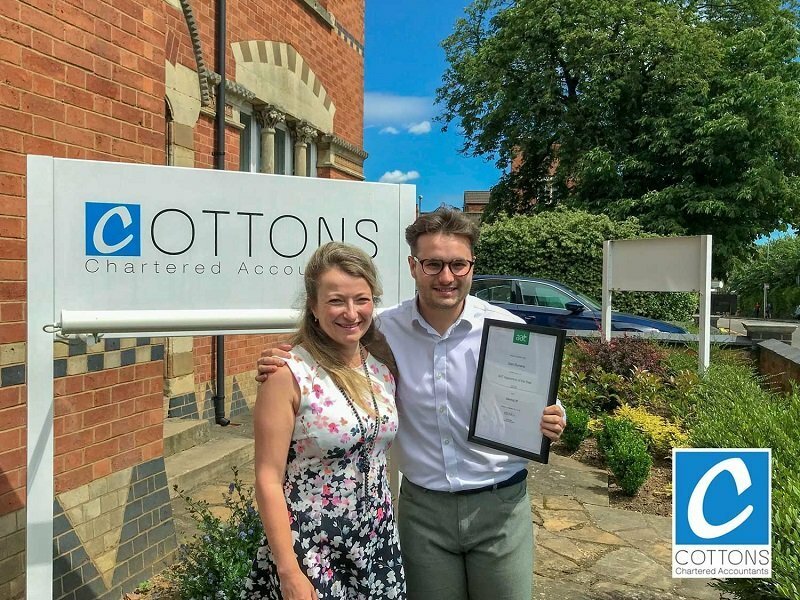 It is with great pleasure we can state that Sam Rumens from our Northampton branch was presented with his Apprentice of the Year shortlist certificate by Heather Deacon from Starting Off. We are all rooting for you Sam and we hope that the next time we write we can say you were one of the winners! If you would like to know more about working at Cottons then check out our latest vacancies. At this point, we would also like to congratulate our accountants in London branch for completing their first year with great success. The London branch has been writing some very interesting content for their local partners, check out this piece they produced on the viability of a cashless society for Colu. We’re looking forward to seeing what they do next! Now, as tax and accounting continue to evolve, Cottons continue to be at the fore of all advances. Not only do we have a dedicated cloud accounting team who ensure the businesses we work with are using the most up to the minute software to simplify their reporting and make them as tax efficient as possible, we also have our very own app too! The free Cottons app has everything from a mileage tracker to keep our mobile business owners on track and a receipt management feature which aims to eradicate those all too familiar folders and boxes of receipts that we all know too well. Find out more about our app by talking to any of our team members or download it and explore for yourself, it’s available for free on both Apple and Android devices. You can also read more about why your business should move to the cloud and other related items on our blog. And of course, we can’t talk about digital advances without mentioning, you guess it… GDPR. Just in case you have been off the grid for the past year, GDPR is the biggest overhaul in data protection law for over a decade and it’s affecting everyone from the general public and large corporates to small businesses. If you do need help with GDPR then we would like to remind you that our Head of IT, Ben Burnett, is qualified to give advice to businesses on the matter so please contact him for guidance. Finally, we couldn’t complete June news without a nod to the World Cup. At Cottons everyone is getting behind their sweepstake teams and of course, we are all getting behind our only home nation involved in the tournament. It’s been great to see England perform so well so far, let’s hope it can continue but also say we will be proud whatever the outcome. The World Cup is a great and inspirational tournament. Find out which of our offices is closest to you.